Cellphone service provider Sprint (S) sure knows how to push a sale. 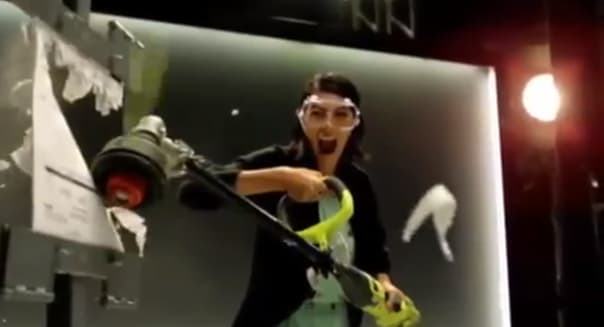 Earlier this month, the company unveiled its new "Cut Your Bill in Half" promotion with TV ads featuring people actually slicing their bills with various implements: a saw, a chainsaw and arguably the best of all, a weed whacker. The delivery was attention-getting, but the message was basic: Sprint wants to poach you as a customer if you're currently signed with either AT&T (T) or Verizon (VZ) (not T-Mobile U.S. (TMUS)) and will reduce your current cellphone bill by up to 50 percent, guaranteeing the new bill in perpetuity under certain conditions (e.g., as long as you stay on the same device). It's a bold move to win market share for the struggling provider. But it's resulting in a renewed fight for customers, particularly from Sprint's closest peer. Sprint's offer has some fine print. The half-off deal covers the calling, text, and data part of the contract -- not the hardware. AT&T and Verizon defectors are required to trade in their existing phones and buy or lease their new devices from Sprint. This requirement makes a difference. One analysis has it that a family of four with one phone line apiece, a 10 GB data plan, and switching out two premium and two mid-range smartphones would get their bill reduced from AT&T's $284 or so to around $210 at Sprint. Those figures for Verizon clients jumping ship to Sprint would amount to just under $265 on a Verizon plan to $220 under the new Sprint plan. So it's not quite half off; in fact, Sprint's CFO was quoted at a Merrill Lynch conference as saying that with Cut Your Bill in Half, most customers "are still probably getting a 20 percent sort of discount." Regardless, 20 percent is a nice, chunky piece of savings. Soon after the initiative's launch, independent tech and telecom analyst Jeff Kagan maintained that he has been "hearing strong and positive opinions from customers in the wireless marketplace" about it. Sprint needs that strong and positive buzz to bring in new customers. Out of the four incumbent cellphone service providers, it's been the laggard for years. Over the past decade, the company (and its predecessor) has posted an annual net profit merely twice, in 2005 and 2006. Revenues haven't improved much; in 2013 on a year-over-year basis they saw a slight drop to $35.3 billion. That, by the way, is significantly below the $40 billion-plus it recorded in both 2006 and 2007. Contrast that with the one-two punch of AT&T and Verizon. Over the past five fiscal years, the former has added to its top line in each of those time frames, posting a net profit every time. The latter, meanwhile, has grown its revenue by 12 percent across that span, also landing in the black in each of those years. In a way, AT&T and Verizon aren't really Sprint's peers; that honor would fall to T-Mobile. That's because Sprint and T-Mobile feature coverage that is less extensive (and less dependable, according to industry tracker RootMetrics) than that of the two giants. Their plans are accordingly cheaper. Which is probably the key reason that Sprint deliberately excluded T-Mobile customers from Cut Your Bill in Half. According to the analysis mentioned above, that model family of four would spend $210 or $220 per month coming to Sprint from AT&T or Verizon. Meanwhile, a comparable setup is already at that level (roughly $213) at T-Mobile. Cutting such a bill in half would bleed money for Sprint. For its part, T-Mobile isn't letting Sprint hog the special-promotion glory. Days after the launch of Sprint's initiative, it unwrapped its Simple Choice plan, which starts at $100 per month for two lines with unlimited calls, text, and data. Up to eight additional lines are $40 apiece. T-Mobile's new scheme has one big advantage over Sprint's: Certain existing T-Mobile customers may opt into it, while the latter company's Cut Your Bill in Half is exclusively for those jumping ship from AT&T and Verizon. What's good for the customer in the form of lower prices can hurt the companies involved. A few days after Cut Your Bill in Half was announced, Verizon warned that it expects that the impact of its own promotions "will put short-term pressure" on profits. Can Sprint and T-Mobile keep up that pressure with their discount pushes? The former's new initiative will apparently run until Jan. 15; no word yet on whether the company will extend it. T-Mobile did not provide a termination date for Simple Choice, saying only that it's available for "a limited time." Either way, it seems as if these types of promotions are already affecting the market. The fight will rage on. Motley Fool contributor Eric Volkman has no position in any stocks mentioned. The Motley Fool recommends Verizon. Try any of our Foolish newsletter services free for 30 days. Check out The Motley Fool's free report on one great stock to buy for 2015 and beyond.